Create a classroom Periodic Table with your students! 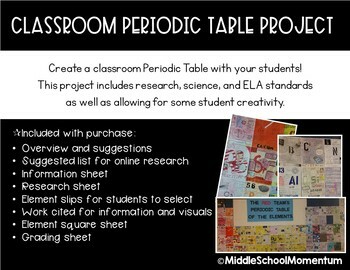 This project will have students using their creativity while completing research and demonstrating knowledge of elements. Each student's element square will be part of the larger periodic table and students love to be able to showcase their work in the hallways to other students or parents. Due to the use of purchased fonts, all of the items included with purchase are PDFs.